Yorktown, Indiana (USA) -- The figure of Jesus as it's presented in the sacred writings of Christianity and developed over centuries of Christian tradition differs in several significant aspects from that of the Buddha, Siddhartha Gautama, as his story is told in the Buddhist sacred scriptures and elaborated over the centuries. To note just two: Most Christians believe that Jesus is the single, unique incarnation of the one holy God. The Buddha is believed by Buddhists one of untold numbers of manifestations of Buddha nature. And for most Christians, Jesus is the savior of humankind, sent by God to rescue women and men from the inevitable effects of human sinfulness. While some Buddhist teachings present the Buddha as something like a savior, most do not. I don't want to gloss over these differences because they are important and have given rise to very distinctive religious perspectives. However, there are also striking similarities between these two great religious founders, similarities that have to do with their both being manifestations of a wide-spread mythic figure known as the hero. First, however, we need to be clear what I mean by "myth" here, because a lot of misunderstanding surrounds the use of the word. As I use the term, a "myth" is not an untrue story. Myths are not the same as fables, folktales, fairy tales, anecdotes or simple fiction. Myths are accounts which convey symbolic truths of great meaning and value for those who accept them. They often form the bedrock of cultures and religions. There are striking similarities in certain types of myths across many cultures. 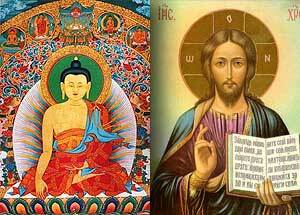 If the story of Jesus is the defining one for our faith, or if the Buddha is our guide on the spiritual path, our understanding can be enriched by a wider acquaintance with the hero myth as a type, and with the variations on that theme represented by these two great religious founders. My understanding of the hero myth and its significance is informed by Joseph Campbell's work in The Hero with a Thousand Faces and by Otto Rank's The Myth of the Birth of the Hero. Campbell identifies a three-part sequence in this myth: separation, initiation and return. But prior to that, there are the birth narratives. The accounts of heroes' births are marked by their unusual features, their miraculous character. They serve to set the hero apart from more ordinary people right from the beginning. To note just a few examples: According to tradition, Jesus was born to a virgin, conceived by God without human intervention. Siddhartha Gautama was born from his mother's side, according to one account, without causing her any pain or discomfort, having been conceived by supernatural means as well. Although Queen Maya and King Suddhodana were married and no mention is made of her being a virgin, Queen Maya's moral purity is spelled out in detail in the birth narratives of the future Buddha. As the story of Jesus unfolds, we learn that his life was threatened by King Herod, and an angel appeared to Joseph to warn him to flee with the child into Egypt. While there is no parallel threat in the Buddhist tradition, Siddhartha's childhood was marred by the death of his mother a week after his birth. In light of the seer's prediction, King Suddhodana struggled, unsuccessfully as it turned out, to prevent anything happening to his son that might lead him to abandon the life into which he had been born and thus become a Buddha. As noted above, the birth narratives of mythic heroes set them apart from the time of their birth and often, before it. The hero is one whose life is marked by trials and challenges, often great danger. The culminating point of the story of the hero comes at the end of the cycle: Heroes successfully navigate the challenges presented, and return with great gifts for humankind. Jesus became known as a savior of humankind. The Buddha became known as one who showed people the way to enlightenment. Both founded religions that have helped to make life meaningful and good for untold numbers of people since their births so long ago.